PIAZZA DEI MIRACOLI/ PIAZZA DUOMO "CATHEDRAL SQUARE"
The Piazza del Duomo ("Cathedral Square"), known with this name in the past, is called also Piazza dei Miracoli ("Square of Miracles"). This name was created by the poet Gabriele D'Annunzio, who, observing it from above on a plane, called it "Prato dei Miracoli" (Meadow of Miracles), because of the beauty marble monuments which stand out on the surrounding green garden. The Square lies at a northern area of the city, that once was a graveyard and the seat of an Early Christian cathedral. Differently from other cities, Pisa's Cathedral Square is not inside the walls nor in the old town. The Duomo was the first monument to be built, followed by the construction of the Baptistery and of the Leaning Tower(the famous Pisa's Tower). Two sides of the square (which represent the northern and western parts) are inclosed in walls that date back to 1154. The Duomo was built between 1046 and 118 and it is wonderful example of Pisan Romanesque style in architecture. The Church, dedicated to Saint Maria Assunta, lies at the centre of Square of Miracles, in the middle of the Baptistery and the Leaning Tower. From an artistic point of view, the church has lots of different ornament styles: classic, late ancient, muslim, bizantine, first Romanesque. The façade was built by Rainaldo. It is made of piers of three doors, with pointed arches on four floors. The cathedral has the longitudinal plan of the so-called Latin cross and an elliptical dome(a common feature of Islamic architecture). The San Ranieri's door is the entry of the Church. The whole entrance has 24 bronze doors and it is painted with Pisano's frescos that represent prophets and stories of the New Testament. Inside the Cathedral there are 5 naves and the terminals of the transept have semi-circular apses. Three naves are divided by monolithic columns with classic capitals and by arches in Islamic styles. All the capitals are decorated with eagles, winged lightning and male heads that come from the Thermal baths of Caracalla. There are many oriental/eastern elements in the cathedral: for this reason, inner spaces seem to be those ones of a mosque. The Dome is decorated with 15th century fresco paintings. One of the most beautiful work of art in the church are: Andrea del Sarto's "Madonna sotto gli organi", a Francesco de Simone's mosaic that represents the Christ Pantocrator and dates back to 1301, Vicino da Pistoia's "Vergine Maria" (1321) and Cimabue's "San Giovanni Evangelista" (1301/1302). Then, visitors can admire "the Pergamo", a wonderful pulpit by Giovanni Pisano, that was rebuilt in 1595, after a terribile fire which ruined lots of works of art such as the 15th century coffer ceiling and Arrigo VII's grave by Tino di Camaiano. 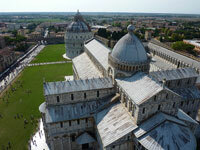 The Baptistery of Pisa is the largest one in Italy and it has a circular plan. The building was began in 1152 by the architect and Diotisalvi and many artists such as Nicola and Giovanni Pisano. On the top of the dome, there's the statue of Saint. John the Baptist. Inside the building there is the Baptismal font by Guido Bigarelli and on the left side of the altar there's "The Pergamo" a Nicola Pisano's master work. IL CAMPOSANTO MONUMENTALE "THE MONUMENTAL CEMETERY"
The Monumental Cemetry lies at the northern part of the Square of Miracles. The ancient graveyard is surrounded by a marble arcade with a rectangular plan. It is said that the soil was brought from Golgota, when Pisa took part in the Fourth Crusade in 1203. The "Campo Santo" suffered major damages during the bombing in 1945 and even nowadays there are works in progress for repairing. 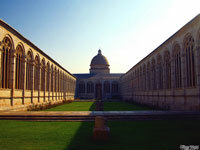 This place is also a wonderful museum of works of art such as sarcophagi and fresco paintings.